Thanks for this great giveaway! I also Liked you on Facebook! Thanks for the chance to win. 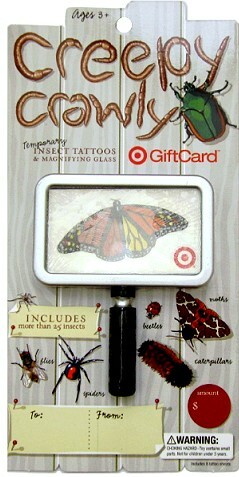 My son would love the temporary tattoos and I would love go shopping. Yes, that magnifying glass would be great for checking coupon expiration dates! Would love the $50 on the gift card too 🙂 Thanks again TT for all you do! I like Totally Target on facebook. Thanks! and I like totally target on fb! I like tt on FB, thanks! hope win love ur give aways! hi, i like you on Facebook! I keep entering ’cause I think it’s so great of you to do it! Thanks. I LIKE you on facebook and I like all your great advice! We totally “like” you on facebook and the great giveaway! I already “like” you on facebook and thanks for this giveaway! my girls would love this card! Adorable! Would love to win,thanks for the great site! Thank you for doing this! Would love to win it! These WOW cards are so cool and creative. Thanks for the giveaway!!! Would love the chance to win this. Thanks. Thanks for the great deals. Love this site. Good luck everyone! Would love to win this. target always seems to have something I need. I want to win this!! thanks! Would love to have the $50 gift card to Target! I already like you on Facebook. Thanks for all you do to save us money! !